BACKGROUND: Service Design, Spring 2017. The brief was to support children with asthma manage their condition. 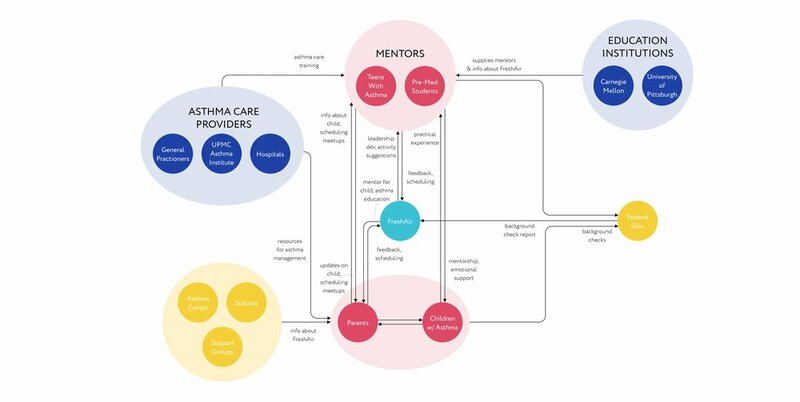 OVERVIEW: A mentorship program that connects asthmatic children with older children who have asthma to provide emotional support & build better asthma management habits. TEAM: Alex Wang, Denise Nguyen, Mika Nomura & myself. MY ROLE: User research, concept development, service blueprinting and video production. Given the broad scope of the brief, we started by brainstorming a list of direct and indirect stakeholders involved in asthma care for children, such as parents, siblings, babysitters, friends/classmates, teachers, school nurse and primary care physician. We then sought to conduct interviews with people from different stakeholder groups. The following learnings from interviews were instrumental in shaping the direction of the project. for emotional support and asthma education? FreshAir provides a mentorship program that connects kids with asthma between the ages of 8 to 14 with older students who have experience dealing with asthma, including pre-med students (especially those with an interest in respiratory care or pediatrics). Through mentorship, we hope to give children with asthma the confidence & emotional support that they need. We want to help them stay physically & mentally healthy through activity-based experiences so that they can develop better habits for exercise & asthma management. The stakeholder map was an important tool to help us situate FreshAir in the existing ecosystem of stakeholders involved in managing a child's asthma. It also helped us work through the details of the service by forcing us to iron out interactions between the service and its primary and secondary stakeholders. Below is a simplified journey map highlighting key steps of using the service. Detailing key steps in the parent, child and mentor's journey as well as the front-end and back-end systems that enable interactions with and delivery of the service. We shared our service concept with a parent who has a child with asthma, an asthma specialist at UPMC's Asthma Institute and a 24 year-old with asthma. All three saw the value in emotional support through mentorship and offered great insights into how to strengthen our proposition. Navigating the ins and outs of asthma management can be tough for parents who are new to this. Unfortunately, there are limited sources of assistance for them. From a conversation with a parent who had faced this struggle, we saw an opportunity for mentors to educate both the child and parents. Mentors would not give medical advice but share resources, provide basic explanations, etc. While discussing peer-to-peer support systems with a children's asthma specialist, she suggested looking for ways to widen networks of support beyond individual mentor-mentee pairs. This learning laid the foundation for community meetups that bring together mentors, mentees, parents as well as physicians and other professionals when relevant. - FOSTERING TRUST: A "verified" logo on a mentor or child's page shows that they pass the basic background check conducted by FreshAir. Additionally, seeing mentors' past experience as well organization logos can help lend credibility. - FINDING A GOOD FIT: Profiles are designed to emphasize the personality, goals and interests of the individuals. Information provided on profile pages are used by FreshAir during the matching process to look for alignment in goals and values. - CONFIDENTIALITY: Mentors and families are given access to each other's profile pages only after they are matched. - PROVIDE SMART RECOMMENDATIONS: Activity recommendations are also made based on an understanding of the child's triggers as well as environmental data. - EMPHASIZE PHYSICAL ACTIVITY: The app prioritizes physical activity recommendations to encourage the child to get more exercise. - BUILD TRUST: Parents and mentors can capture moments during meetups using the app's journal to save and share memories. Over time, it serves as a catalog of important moments that reinforce the mentor-mentee relationship.